L to R Tess Bloomer, Gillian McLachlan, Kay Eccleston, Val Franey. Happy New Year to all the Grafton women golfers, we look forward to a year of good golf and camaraderie. There have been some very resilient ladies playing throughout the summer break in the heat and some very good scores, which is a credit to all of them. Wednesday January 23 18 hole Stableford was the last round of the Bendigo Bank “Summer Consistency Cup” and there were 37 starters. Div 1 winner – Heather Purtill 40pts; r/up – Sue Petty 39pts; 2nd r/up – Peg James 37pts. Div 2 winner – Sonya Baker 35pts c/b; r/up – Jan Patterson 35pts; 2nd r/up – Sharyn Rowles 33pts c/b. Div 3 winner – Jan Davis 34pts; r/up – Bev Snowdon 32 pts c/b; 2nd r/up – Gai Leeson 32pts. NTP’s: Heather Purtill (1st); Sharyn O’Grady (6th); Heather Purtill (10th); Marianne Mannell (17th). Eight pro balls given on the day to 31pts. Our Club professional Mark Harvison (6642 5413) will be conducting two clinics for beginners/nine hole players this year. They will be on Monday February 4 & 11 from 9.30 – 11am and 5.30 – 7pm at $2 per lesson. For all those new to golf, come along and I’m sure you will enjoy the game, especially after a couple of lessons from Mark. As you may all be aware, there are quite a few rule changes to be implemented this year. The club is running a rules evening on the Tuesday February 5 at 6.15pm. All welcome. Nine hole Monday players will be February 18. It will be a 4 person Ambrose (dropout) with draw for teams. Please bring a plate for morning tea. Wednesday February 6 will be a four person Ambrose (dropout), sponsored by the Jacaranda Hotel with an 8.30am shotgun start and a draw for partners. Please have your names into the computer as soon as possible as the draw for Wednesday 6 will be done on Monday February 4. For those who do not have access to a computer, you may ask a friend to nominate you or Mark at the Pro Shop is always willing to put you in the draw. Also, Trevor or Heather in the clubhouse are more than willing to process your nomination at any time. Please drink plenty of water and be sensible in the heat. Post entries welcome however will be only taken singularly. Friday February 8 is an 18 hole Stableford. Saturday 9is a 2BBB draw for partners; time slot 7.26 – 8.06am. Please note that you must play in allotted time set down by the Match Committee to be in the competition of the day (sponsored by Shirley Goodger). Phone Mark for bookings. This year’s NTP sponsors: Wednesday 1st (Holiday Coast Meat) – 6th (MJO Legal), 10th – Clarence Valley Tyres, 17th – Ford/Dougherty Property; Friday (Coffee Club); Saturday – Grafton Motor Group. 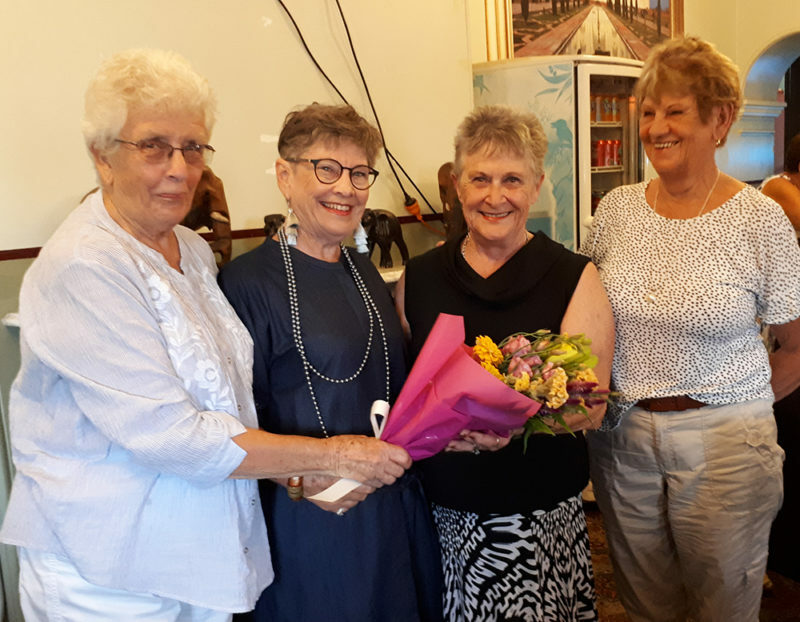 Sunday evening 52 ladies attended an enjoyable farewell dinner for Kay Eccleston. Kay has been a long time member of the Grafton Golf Club and is now retiring to Laurieton. Kay will be playing golf at Kew. We wish her all the best and hope to catch up again in May when she plays in our May tournament.